Good morning. Tis wet and gray outside with temps of 48F degrees. Yesterday I heard the weatherman saying that we had 5 to 8 inches of snow coming this weekend. Aye yi yi! We'll just wait and see what comes our way. 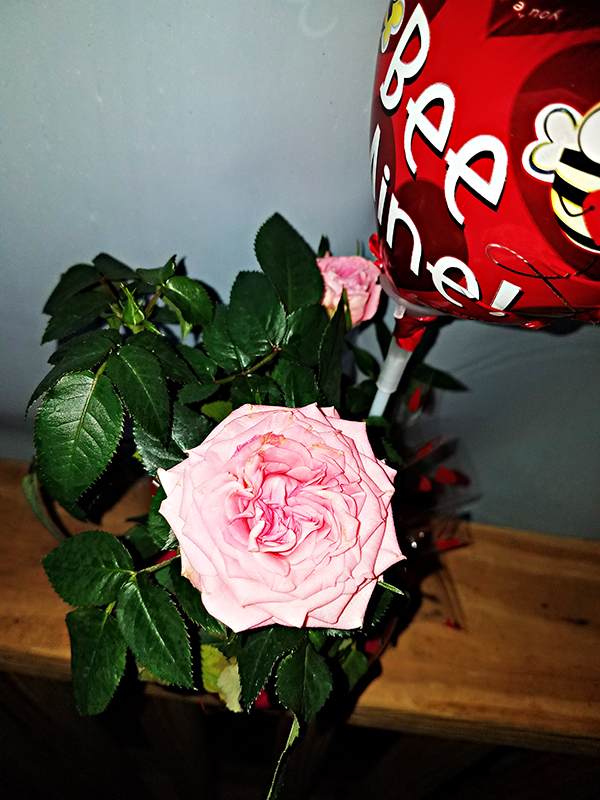 Yesterday I promised photos of my new miniature valentine rose plant. I took it out on the porch to photograph it in natural lighting. Isn't this just the cutest? Of course, when it starts getting bigger I'll have to re-pot it, but for now it looks super in the little lady bug pot. I just can't wait for Spring. In a few more weeks, we'll be able to take down all the screen covers and the heavy plastic on the porch. Then it will get a good vacuuming and set up. It will be so nice to sit out there and watch the birds and small critters. The news yesterday and last night was consumed by the mass shooting in the Florida school. I watched it for a while, but then I had to shut it off. It's really quite sad to see how some of these younger generation kids have no morals or respect for life and law. You can blame it on mental illness or whatever else, but they were raised so differently from the folks in my generation. A lot of them seem to think that the laws are only for others, not themselves. But then I look at the people making the laws and I wonder sometimes where their brains are. Who in their right mind sells an assault weapon to an unbalanced eighteen year old? Why are the laws of that area so lax? What type of background check was done? Why wasn't anything done about the sick things the shooter was posting on the web? Of course, the first thing that lawmakers will push for will be more gun control aimed at all the legally licensed gun owners. Sadly, this will not prevent any future mass shootings. Most legal gun owners have been required to attend courses on gun safety and gun laws. Most have even taken one or more classes on shooting a gun. Intensive background checks are done, and fingerprints are taken to be kept on file in all the national and local data bases. Background checks are run again before we can even buy a gun, and then the gun is immediately registered. All this kind of makes me wonder why we don't have to go through this same lengthy regime in order to buy an automobile. I mean, how many people have been killed by automobiles? Sorry about the rant, folks. I'm really annoyed at the lawmakers' responses to this shooting. My heart goes out to all the families of the victims. This should not happen to our children. School should be a safe place. The streets should be safe too. Rant over. Last night, I took a photo of Pogo while he was playing one of his regular games. Well, at least I call it a game. When he wants something, he turns his back to me and stares at what it is that he wants. When he wants to be picked up and put on the big sofa, he'll stand and stare at the sofa. When he wants food, he'll stare at his dinner mat. In this photo, he has turned his back to me and is staring at his dinner mat where there is no dish. This is him telling me to get up and get him something to eat. He will look at me until he gets my attention, then turn and stare at the mat. 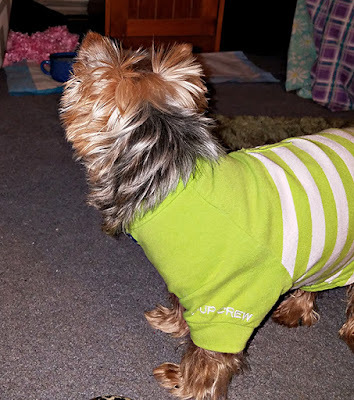 Does your fur baby do this? Now I need to do a few things before it's time to leave for my doctor appointment. Daughter Deanne will be picking me up soon. This morning I took the last of the antibiotic that I've been on. I still have the cough, but it isn't quite as bad as it was. (as long as I take cough syrup) Now I just have to get my breathing better. Before I take my leave, I want to send prayers and good wishes to Audrey and Mac for a safe flight tomorrow to Austria. Have a wonderful time. I love you. Take lots of photos!! I'm off now. So till Sunday, Y'all have a fantabulous weekend. I couldn't watch or read too much of the shooting. It was just too painful. I am with you on the law makers. Sadly not every state is like yours. I think that they should intensify the background checks as well and make everyone who has a gun to go to classes. I am at a loss with the law makers. What a gorgeous plant and I love the lady bug pot. Yes it will be so nice to sit out on your porch and just enjoy the days. I really hope that it is not too hot for you this summer as it was last summer and you can enjoy it more. We are getting a norther blowing in late this evening or tonight. It has been hot and muggy here we are. But it always gets warm before the cold front comes in. I just hope that it does not freeze again. I love how Pogo turns his back to you and stares at what he wants. Cisco will sit in front of something and paw it. If he wants to go out, he will come and tap his paw on our legs to let us know he wants out or food. We really have to keep an eye on his water bowl. For some reason he will drink it all but not let us know he wants or needs water so we all are in charge of checking his bowl and giving him fresh water several times a day. I think that I am going to lay down and sleep a while. Hugs to you and Pogo. Hope that you get a good report from the doctor so you will be able to get rid of that nasty cough. Have a great day and I will take to you soon. Love, Beth and Cisco. 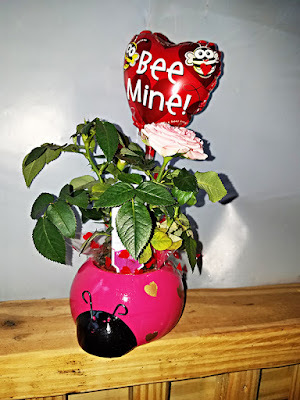 Your pink rose is so pretty and th balloon and pot are nice too. Pogo really knows how to let you know what he wants dogs are quite clever really. That shooting was aweful We had it on the news too. Unbelievable that a young person of 18 years can get such a weapon or whatever weapon at all! But be sure, things like this will happen again and perhaps even more often. Oh Audrey and her husband will certanly have a great time in Austria! I often went to Austria in the past and it is a beautiful countryand they allso have great food LOL! We have cold weather at the moment and during weekend and next week it will even become colder. Real frost during the night, at daytime 3-4 C above zero, but most of the time the sun will shine they say. Still I am not happy about this late cold. We soon will have already March and think it will be time temperatures go slowly up to announce Spring time. Yak, I am not happy with that cold. Okay, I will quickly have to read your other posts and then must prepare to eave for the hospital. Yesterday Jan was at least fever free, they are still trying to find out what kind of infection he has. They though urinary, but it wasn;t. May be I'll here a bit more today.